Download our August/September 2015 Advocate now: To read and print the newsletter, click the image. 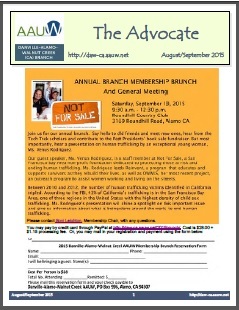 Details about our Annual Membership Brunch and General Meeting. Update on Neighborhood Groups and Appreciation Party. Update and pictures of our Annual Installation and Awards Ceremony. Great pictures of our first Annual Member Appreciation Party. Please support our advertising sponsors: American Heroes Sleep Project, Danville Band, Diablo Printing, East Bay Flowers, Minoo’s Aesthetic, Montecatini Ristorante, Attorney Sarah Nix (Gagen McCoy), Jennifer Krommenhoek (Sotheby’s Realty), Spirit Space (Bill Williams), Rodney Worth’s restaurants. During the summer and our executive board transition (from 2014-2015 to the 2015-2016 officers), we will not have a July 2015 issue, submission deadline for the August 2015 issue of The Advocate is July 15. Please provide all website, newsletter or calendar submission through our submittal webpage. Happy summer everyone!